(Bloomberg) -- The guardian of the punch bowl is at risk of becoming the punching bag. The Federal Reserve continued to signal at its meeting Thursday that “further gradual increases” in interest rates are coming for the “strong” U.S. economy. It’s a message that could be increasingly unpopular as Democrats and Republicans seek more spending next year while gearing up for the 2020 fight for control of Congress and the White House. “Austerity is going to be on nobody’s platform for the foreseeable future,” said Lou Crandall, chief economist at Wrightson ICAP. Democrats and Republicans will push the U.S. toward “peak fiscal indiscipline” over the next couple of years, he said. What both parties have learned is that, for now, the debt-carrying capacity of the economy appears to be high. One reason is the U.S. continues to be the world’s biggest provider of safe assets. The way the Fed keeps inflation expectations nailed down in a hot economy is by signaling it is vigilant and will continue to nudge rates higher so long as growth and hiring is strong.Futures market investors are pricing in a 75 percent probability that the Fed hikes a fourth time this year in December. 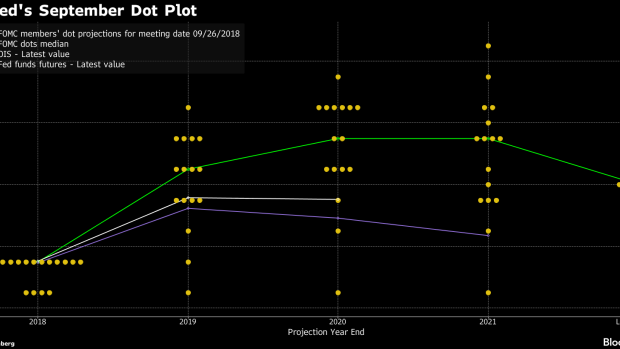 U.S. central bankers project three more hikes in 2019. Fed officials don’t know how far they have to raise rates to keep supply and demand in balance or where “normal” is in the post-crisis economy. If financial markets tailspin, or if activity cools suddenly, they will pause and probably face some blame. At least one loud voice of Democratic orthodoxy is telling them to be careful.